I’ve made apple pie a couple of times in my life. None so bad as my attempt a couple of months ago. I followed a pretty basic recipe I found online and the results were terrible. The apples were not pre-cooked so it was a soggy mess of sunken apples with a bunch of hot air in between the apples and the crust. It’s rare that I throw out food I’ve made, but after one serving of watery pie, this was a MUST TOSS. I have a weird preference when it comes to apple pies: I like thick apple pies, with the apples packed tight and layered sky-high like potatoes au gratin. 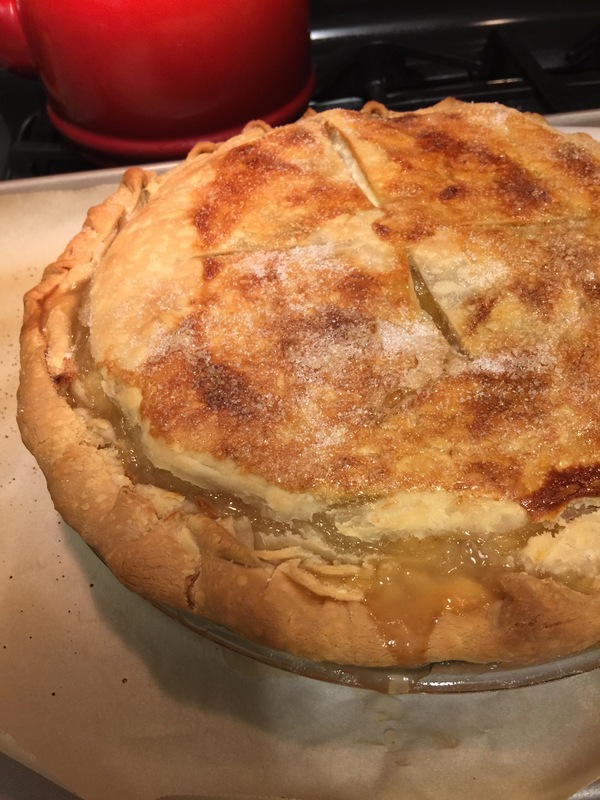 Of course I’ll take a homemade apple pie anywhere, and I have no idea where I had this thick, deep-dish apple pie, but I’ve wanted to try and recreate it at home. When I stumbled upon Cook’s Country’s deep-dish apple pie recipe I bookmarked it and left the magazine on the counter for immediate trial. Contrary to Salon’s Laura Miller, I love me some Cook’s Illustrated. As someone who knows nothing about science, I absolutely love their explanations for their conclusions on what makes the best recipe. I could read their cookbook like a novel. And I’d probably learn more by doing this than I did in an entire semester of chemistry. Before I get to the recipe, let me share their tips: pick two kinds of apples. This was mind-blowing to me. But made perfect sense. You pick one from the tart group: Granny Smith, Empire and Cortland. And one from the sweet group: Golden Delicious, Fuji, Jonagold and Braeburn. 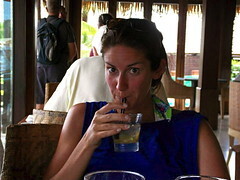 I went with my two faves: Granny Smiths and Fujis. According to CC, this adds more flavor. And because apples break down differently, choosing two varieties will add texture, as well. 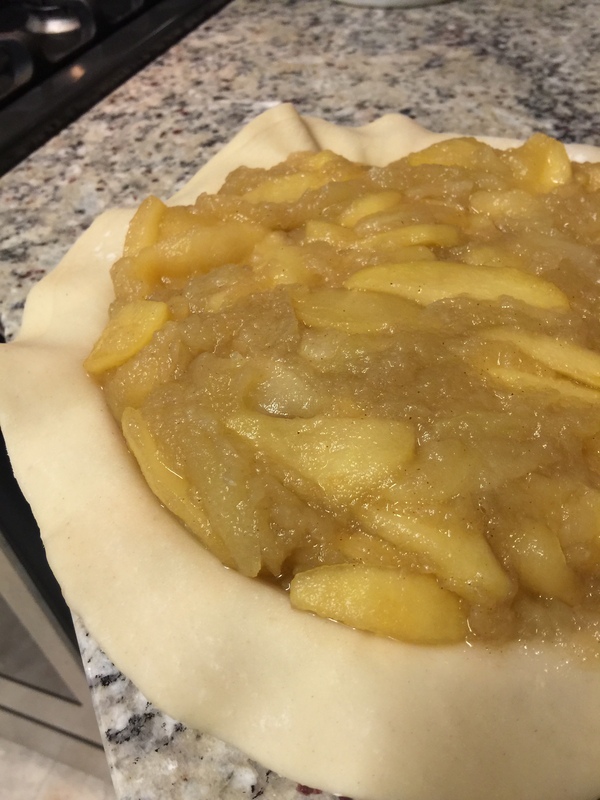 Cooking apples before you build a pie will help you avoid shrinkage and a watery pie — the unappetizing problem I ran into with a big air pocket between crust and apples on my first attempt. Cut 4 3-inch slits in the top crust. This recipe calls for ready-made dough. And a 9-inch pie plate is fine. You don’t need a deep dish pie plate. Toss apples, granulated sugar, brown sugar, lemon zest, salt and cinnamon together in Dutch oven. Cover and cook on medium heat, stirring frequently, until apples are tender when poked with fork but still hold their shape, 15 to 20 minutes. Transfer apples and their juice to rimmed baking sheet and let cool completely, about 30 minutes. Roll 1 dough into 12-inch circle on lightly floured counter. (If dough is soft and sticky, refrigerate until firm.) Loosely roll dough around rolling pin and gently unroll it onto pie plate, letting excess dough hang over edge. Ease dough into plate by gently lifting edge of dough with your hand while pressing into plate bottom with your other hand. Leave any dough that overhangs plate in place. Wrap dough-lined plate loosely in plastic and refrigerate until dough is firm, about 30 minutes. Roll other dough into 12-inch circle on lightly floured counter, then transfer to parchment paper-lined baking sheet; cover with plastic and refrigerate for 30 minutes. Adjust oven rack to lowest position and heat oven to 425 degrees. Drain cooled apples thoroughly in colander set over bowl and reserve 1/4 cup of juice. Stir lemon juice into reserved juice. Spread apples in dough-lined plate, mounding them slightly in middle, and drizzle with apple juice mixture. Loosely roll remaining dough round around rolling pin and gently unroll it onto filling. Trim overhang to 1/2 inch beyond lip of plate. Pinch edges of top and bottom crusts firmly together. Tuck overhang under itself; folded edge should be flush with edge of plate. Crimp dough around edge of plate using your fingers. Cut four 2-inch slits in top of dough. For topping, brush surface with egg white and sprinkle with sugar. 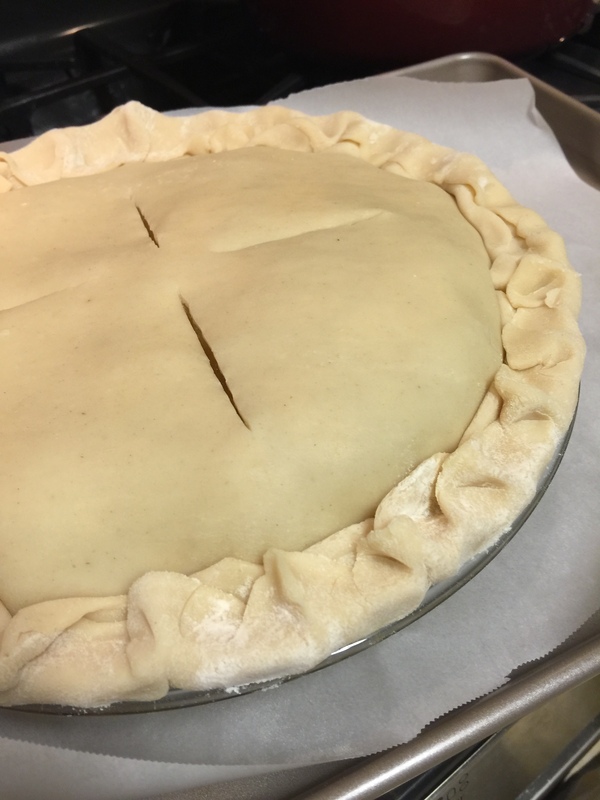 Set pie on parchment-lined rimmed baking sheet and bake until crust is light golden brown, about 30 minutes. Reduce oven temperature to 375, rotate baking sheet, and continue to bake until juices are bubbling and crust is deep golden brown, 30 to 40 minutes longer. Transfer pie to wire rack and let cool until filling has set, about 2 hours; serve slightly warm or at room temperature.